The Association of Digital Forensics, Security and Law, directed by Longwood University College of Business and Economics professor Dr. Glenn Dardick, hosted its 7th annual two-day Conference on Digital Forensics, Security and Law last week in Richmond, VA.
...academics and practitioners...come together to hear about and discuss trends and leading edge research from experts in cyberforensics, security and cyber law. In keeping with the importance of the ADFSL conference, Dr. Chawki spoke about IT and Regime Change, a topic that challenged attendees to reflect upon the increasing importance and power of social networking and other information communication technologies upon the world and within their own respective countries. Following Dr. Chawki, Mr. Wilson gave his thoughts on Digital Experts – Why is Effective Communication So Important to Both the Admissibility and Persuasiveness of Expert Opinion? Mr. Wilson’s presentation gave attendees new perspectives on the skills required in presenting technical evidence within courts of law. Both speakers engaged the international audience with critical information concerning the well-being of national security and the integrity of the judicial systems at home and abroad. In addition to the keynote speakers, 16 research papers in the areas of digital forensics, security and law were presented. 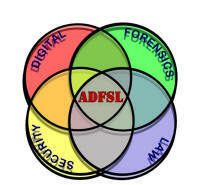 To learn more about the annual ADFSL conference visit http://www.digitalforensics-conference.org/. Longwood’s College of Business and Economics, accredited by AACSB International, prepares effective and successful business leaders by guiding students to develop to their full potential. A dedication to leadership values and ethics builds upon Longwood University’s mission to develop citizen leaders. The College is committed to developing leaders in cyber security through the Longwood Center for Cyber Security, a BSBA in Information Systems and Security, and a minor in Cyber Security. The Association of Digital Forensics, Security and Law was founded in 2006 by Dr. Glenn Dardick of Longwood University. The mission of the ADFSL is to provide an avenue for academics and practitioners to share experience and research in areas of digital forensics, security and law and in particular the intersection of those areas. The ADFSL hosts the ADFSL conference annually and focuses on the prominent role of digital forensics in law enforcement, network security, and information assurance. Dr. Glenn Dardick holds a Doctoral degree from Virginia Commonwealth University with a major in Information Systems and a minor in Finance. He is an Associate Professor of Information Technology at Longwood University, the Director of the Longwood Center for Cyber Security, and an adjunct Associate Professor of Information Systems at Edith Cowan University in Perth Australia.